On Monday I flew on Air Greenland from Kangerlussuaq to Ilulissat. 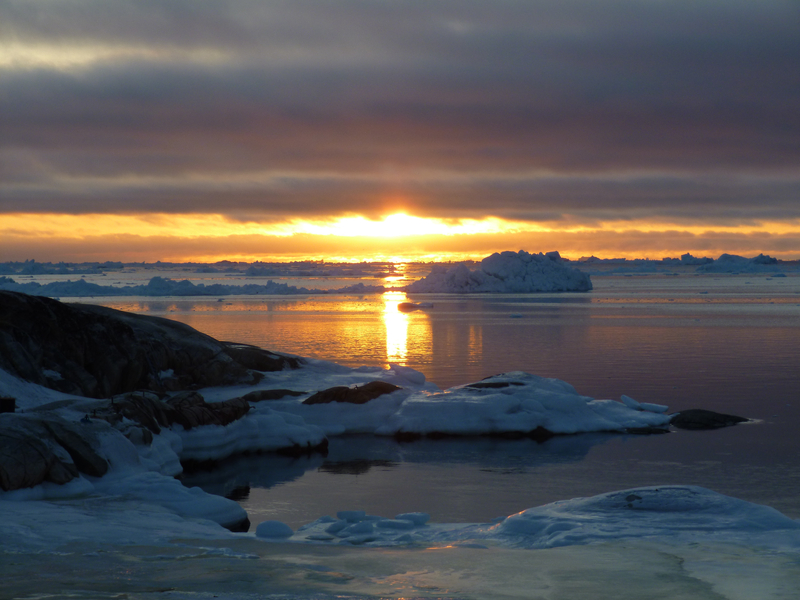 I have now been in Ilulissat for 3 glorious nights, and I have 14 nights more. I have had the pleasure of visiting Ilulissat twice before, so this has been a fantastic return trip! Last June, I spent 11 nights in Ilulissat with Visit Greenland, Ace & Ace, and Chris Coubrough to film the fifth and final episode of Taste of Greenland. Then in August, I spent half a day while sailing on Sarfaq Ittuk, the coastal ferry run by Arctic Umiaq Line. I know about the flat because its owners are relatives of my host family in Nuuk, but it is for rent to the general public! It is a small studio flat with a private entrance and mudroom, private balcony, private bathroom with shower, and private kitchenette (two burner stove, mini fridge, shelves for storing dry goods, pots, pans, dishware, utensils, and tea kettle). There is a small table for dining, a chest of drawers, a television, and a radio. The flat is virtually next door to Hotel Icefiord where there is a nice restaurant and bar, and it is just a 15-minute walk to the center of town where there are plenty of shopping and dining options and all of the tour companies’ offices. What more could you need!? I was very much looking forward to seeing the Ilulissat Ice Fjord and a sea full of icebergs during the winter season… and I have not been disappointed! My expectations were that the icebergs would be much, much larger than in summertime, and that they would be eerily locked in place because of a frozen sea. Well, I was correct about their larger size, but I was incorrect about them being locked in place. The sea is not totally frozen, so the icebergs are free to move around… and they do! Since I am gearing up to travel to Ilulissat, the town whose very name means “icebergs”, I figure there is no better time to give a small lesson about ice and icebergs in Greenland. As a disclaimer, I am no glaciologist, so please do not take everything I say to be scientifically precise J But I do know enough from what I have learned in Greenland to provide some useful information. If anybody is interested in a truly spectacular and awe-some portrayal of glaciers, do check out Chasing Ice, a big-screen documentary (by James Balog, National Geographic photographer/cinematographer) that artistically displays how glaciers flow, depress, and calve over time. The images document glaciers in Greenland, Iceland, and the United States. One may ask: Are there not icebergs all over Greenland? 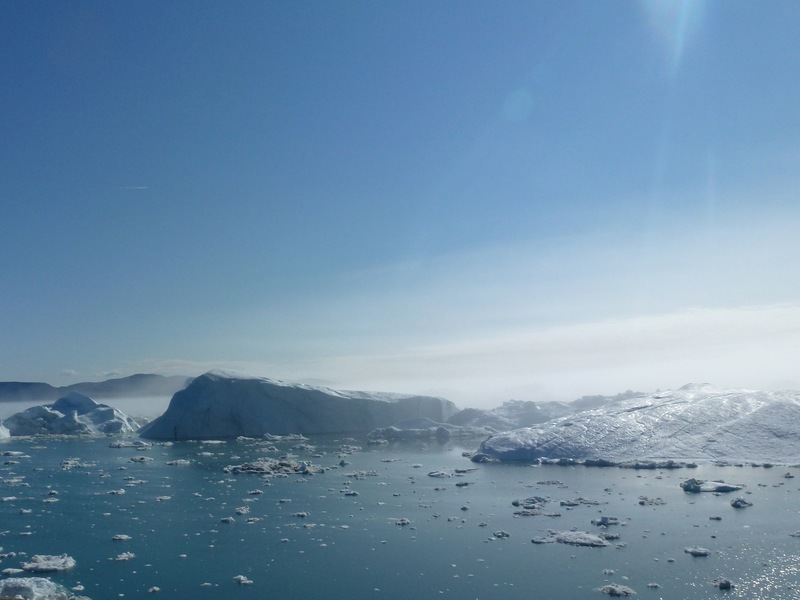 Why does Ilulissat have the pleasure of being the namesake town for icebergs? The answer is: Yes, there are icebergs all over Greenland. 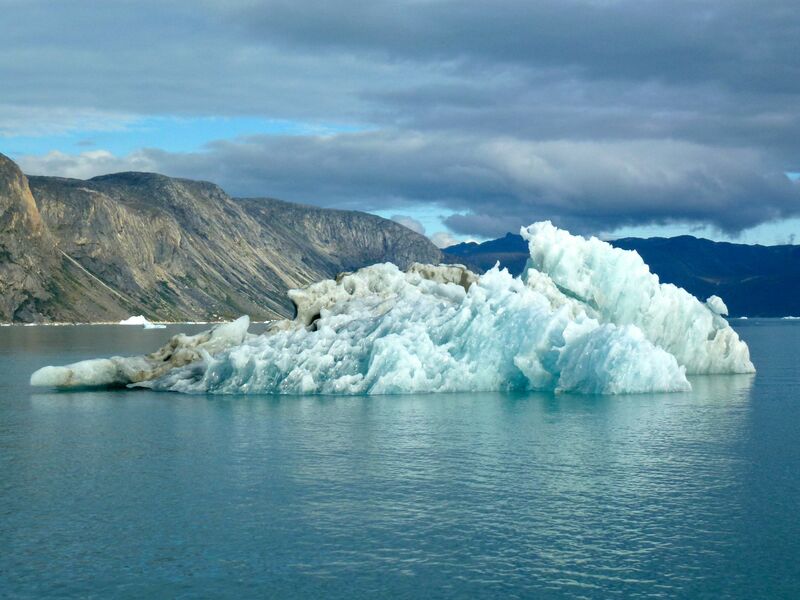 Icebergs originate from glaciers that flow into a body of water, creating a tongue that floats on the water whose front breaks off (“calves”) in pieces of all shapes and sizes – the icebergs. When I say that glaciers flow, one may think of liquid water; but a glacier is frozen ice. It flows due to its own weight, and it is not detectable by the human eye just standing and watching for a short period of time. The Greenland Ice Sheet is itself one huge glacier, and it flows into the water in hundreds of places all over Greenland. Therefore, there are icebergs all over Greenland. 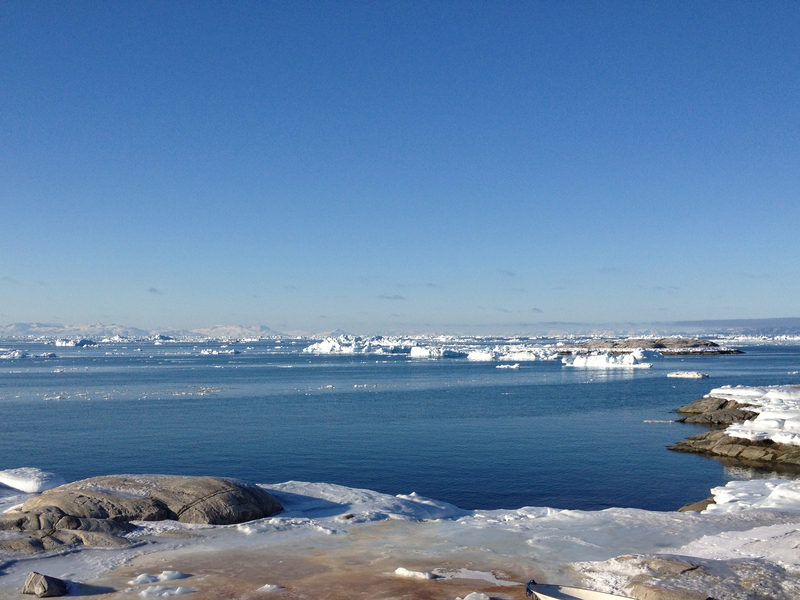 Ilulissat is especially well known for icebergs because the glaciers in its immediate area (Sermeq Kujalleq and Eqip Sermia) are especially active. They move faster, and thus calve more frequently creating more icebergs, than other glaciers in Greenland and in the whole world! Sermeq Kujalleq, more commonly just called Kangia or the Ilulissat Ice Fjord, is one of the fastest flowing glaciers in the world. It currently flows about 35 meters a DAY while other glaciers in the world only move that far in a year! However, despite the glacier’s fast pace, it is currently in a state of rapid retreat (moving closer and closer toward land). 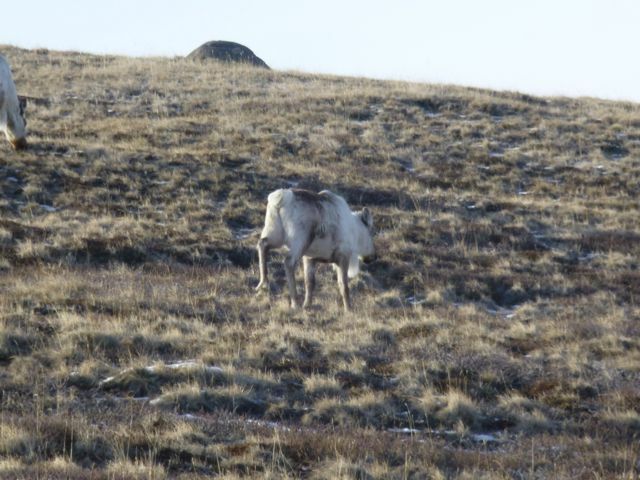 Glacial retreat IS a natural occurrence, but the rate at which Sermeq Kujalleq is currently retreating is what is unprecedented. Sermeq Kujalleq has actually been slowly retreating since about 1850. But in 1998, the glacier suddenly started flowing twice as fast as before, its surface level depressed, and its floating glacial tongue calved off entirely. In just 10 years, the glacier retreated 15 km (9 miles) when previously it took 80+ years to retreat that far. The Ilulissat Ice Fjord was granted UNESCO World Heritage Site status in 2004, so the area is now protected. 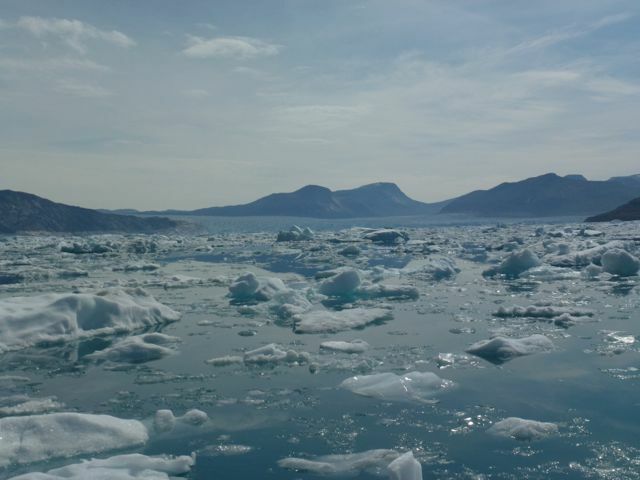 This is a picture of the Ilulissat Ice Fjord, taken in August 2012. 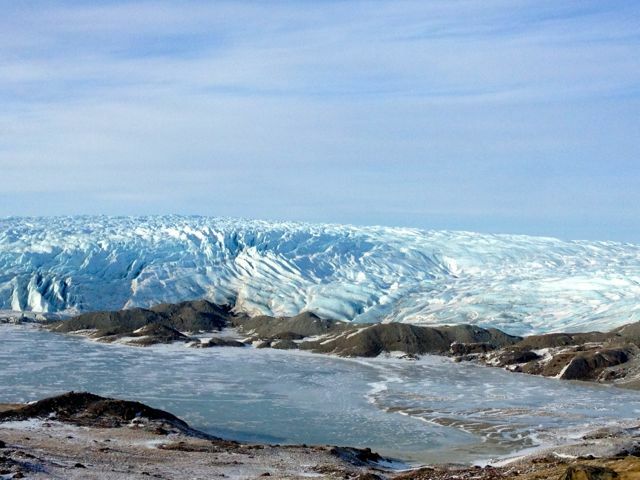 This is a picture of Eqip Sermia, a glacier just north of Ilulissat that calves very frequently, taken in June 2012. It is an extremely popular attraction for tourists. There are sailing tours to view it from the water, and there is also the possibility to stay overnight in small huts/lodges on land close by. This is a picture of Narsap Sermia, a glacier just north of Nuuk, take in July 2012… and an iceberg that originated from it. 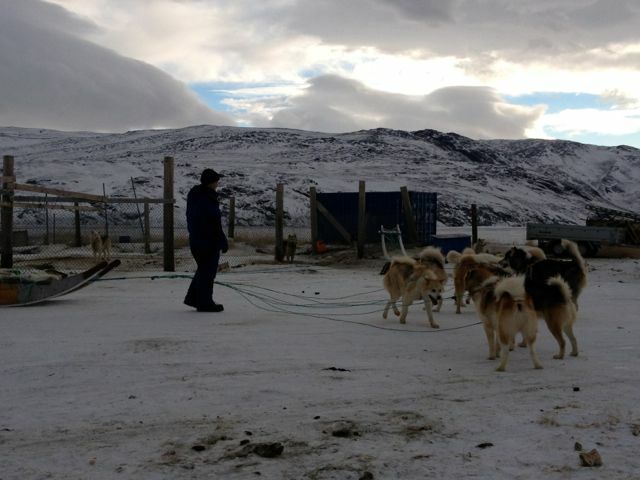 Kangerlussuaq is more than just the busiest airport in Greenland; it is a great winter bang-for-buck destination where you can experience 4 of the Big Arctic Five attractions – the Inland Ice, the Pioneering People of Greenland, Northern Lights, and Sled Dogs! 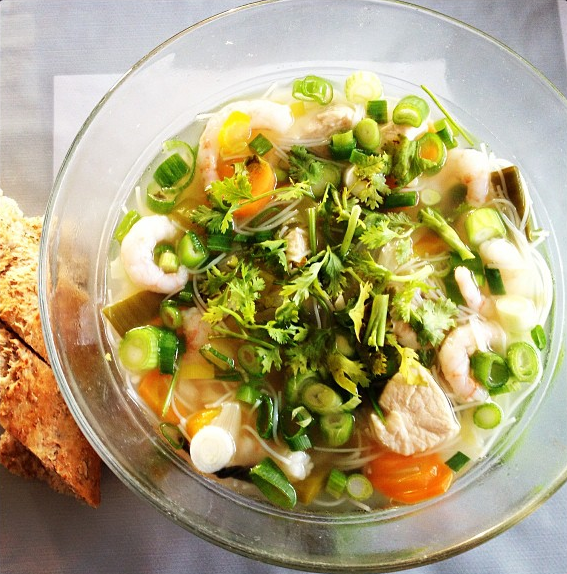 There are also a few restaurants where you can dine on traditional Greenlandic specialties served in a modern gastronomic fashion. And, if you are the wandering type, just step out your back door and take your pick of walks along the mountains. 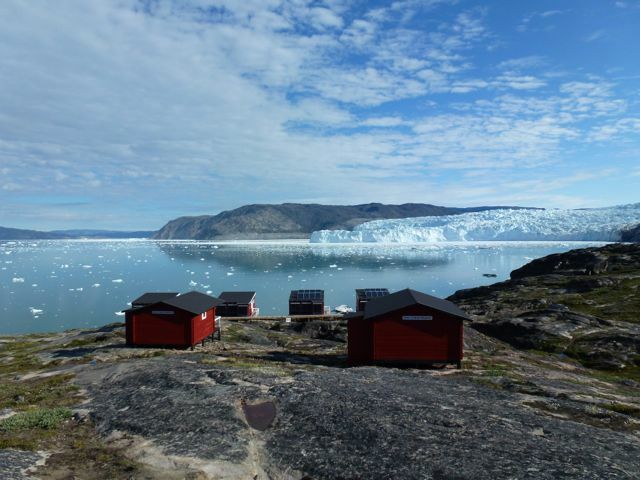 The panoramic views from the fjord to the Inland Ice are truly one of a kind on Greenland’s west coast! With a good book to pass the time between the day’s activities and dinner or Northern Lights watching, one could easily spend 5-6 nights here. 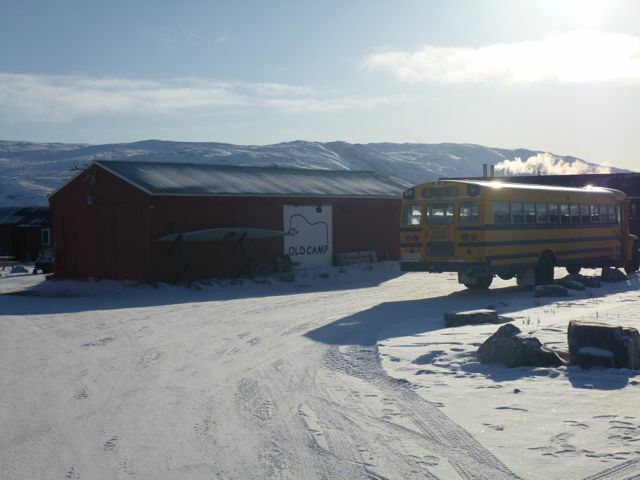 But, if you like being on the go from one activity to the next, you could make Kangerlussuaq your next long weekend destination! 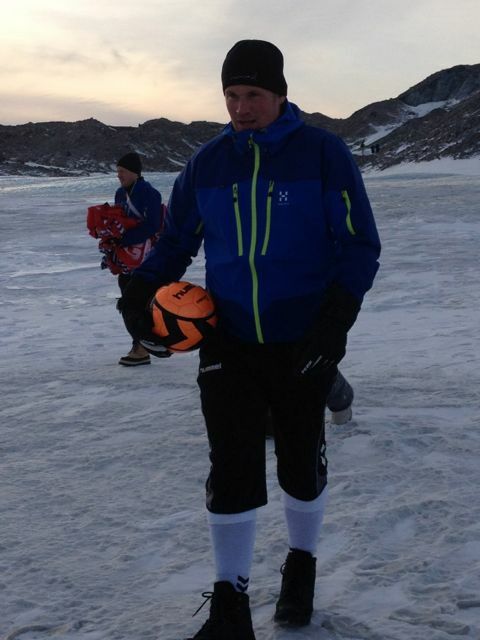 As for me, after 17 nights here, I am ready to move along to my next destination – Ilulissat! Today a tourist was pulling my leg a little bit and asked me if the tables were turned, would I actually agree to be interviewed by a random person that came up to me in the airport? In most cases, I think I would, but of course my current job has a lot of influence on that answer! But, it made me really think about how I would answer the questions that I ask in my survey. Some of them are difficult and require thoughtful consideration, so my hat goes off to the 300-some tourists who have been so kind as to entertain my probing questions during their precious holiday time! And who are able to produce such coherent and insightful responses in a short time! So here are my answers to some of the actual questions that I ask tourists in Greenland every single day. If any followers out there feel so inclined, I would be happy to hear your answers, as well! What destinations are on your dream list of places to travel, and why? I have seen SO little of the world, and even of my own country, that the short and easy answer is: everywhere! It is easiest to first pinpoint what I am NOT attracted to. I am not interested in overly modern and industrialized destinations, so traveling in Europe is not a priority for me. Of course, it would be better than simply staying at home, but I would much prefer to see other parts of the world first. Some may mistake me for a “nature person”. It is true – I do love being outdoors, going on hikes, being on the water, and so on. But what I really like is nature-based culture – human societies that have historically lived off the land, and preferably still do! I joke that I think I was born about 10,000 years too late… that I would have been perfect for the hunter-gatherer era! I am also very interested in linguistics and the evolution of languages due to interaction between different societies. I can thank Dr. Lise Dobrin at the University of Virginia Anthropology Department for that! So now having thought through that, I have come to the conclusion that my dream list is more a list of cultures that I want to experience than a list of places I want to see. I dream of traveling for the purpose of experiencing human societies that have maintained a life that is very in tune with the environment and to some extent, isolated from the modern world. I think most people would consider these cultures as “primitive”. I debate the political correctness of that term and also the reality of it. Yes, there are still foraging or nomadic societies, but the mere fact that we know about them indicates that they have been touched by modernity to some extent. So, in no particular order, I would like to experience any societies in the Amazon Rainforest, but particularly the Huaorani in Ecuador; I would like to experience the Sami in northern Finland, Norway, and Sweden; the Maori in New Zealand; the residents of Tangier Island; and the residents in the Canary Islands that use a whistle language. I would also generally like to see Central America, South America, Southeast Asia, and more of the Arctic. On holiday, do you typically seek to experience the nature, the culture, a combination of both, or something else entirely? On holiday, do you prefer to observe the destination, interact with it, or immerse yourself in it? I think what realistically happens is that I interact with a destination. But what I would ideally like to happen is that I immerse myself in it. In all actuality, I would like to do a mini-ethnography when I travel! How many international holidays do you take in a typical year? Do you typically use a travel agent to make arrangements? Are you typically attracted to packaged itineraries? No. But I will say that if I were traveling to Asia, specifically China, I would be extremely likely to purchase a packaged itinerary because it is my (ignorant) impression that that is just how tourism is done there. For instance, all the Living Social travel deals to China are 10-14 day fully planned trips. They never advertise deals for just a piece of a holiday to China like most other destinations on Living Social. On a scale of 1-5, how important are the following aspects of holiday travel to you? 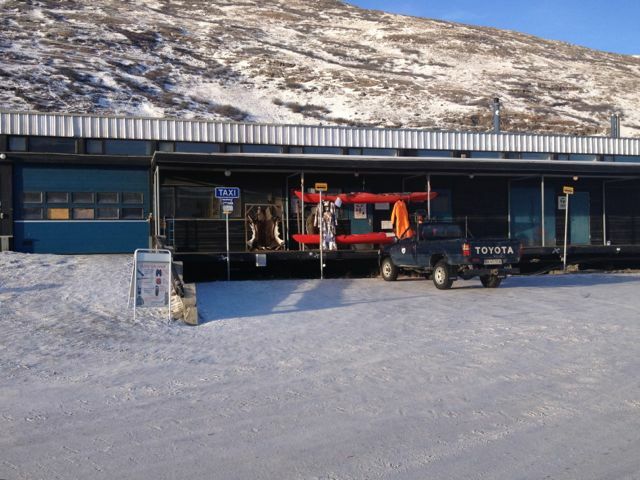 Kangerlussuaq is a small airport-centric town. The runway bisects the town into a northern part and a southern part, and you can only get around it by way of one main road. The airport terminal is on the north side of town and inside the terminal there are a few souvenir shops, a bar, a cafeteria, and a nice dining room. 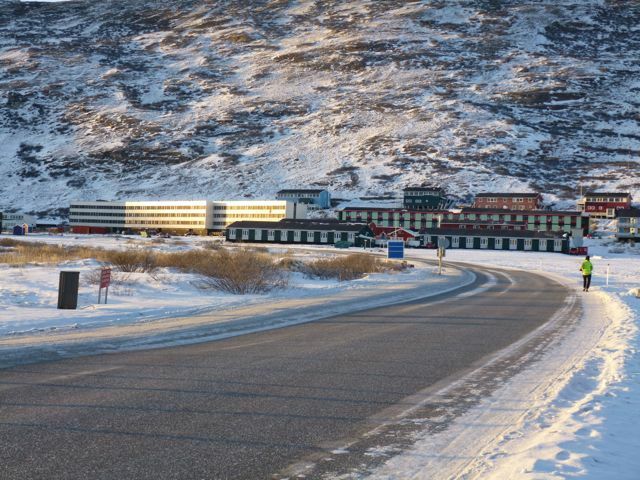 The nicest lodging in the town, Hotel Kangerlussuaq, is connected to the terminal, as is the Conference space. These Greenland airports are nothing like in the States. There are no security personnel, and the doors are not locked during off hours; people are free to walk in and out as they please since the building houses so many other facilities. It is really just like a community space once all the incoming and outgoing flights have occurred for the day. It is one large room; you walk in and are directly in the passenger waiting area. There are just two gates! Then off to the left are the shops and a sitting area, which doubles as the hotel reception area, and past that are the cafeteria and dining room. 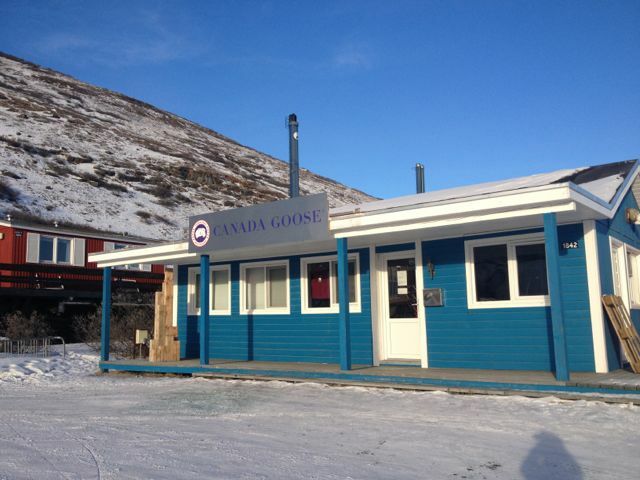 Just a stone’s throw away from the airport is the World of Greenland Arctic Circle (WOGAC) Polar Lodge and Souvenir Shop, where I am staying. 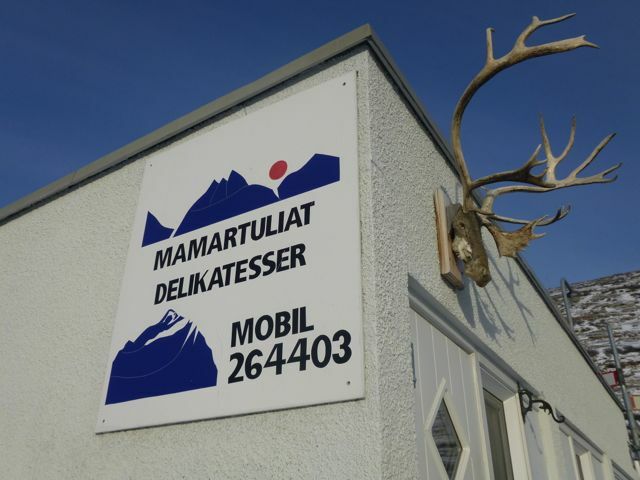 This tour operator sort of runs the town in that it owns many of the lodgings and souvenir shops and even restaurants! 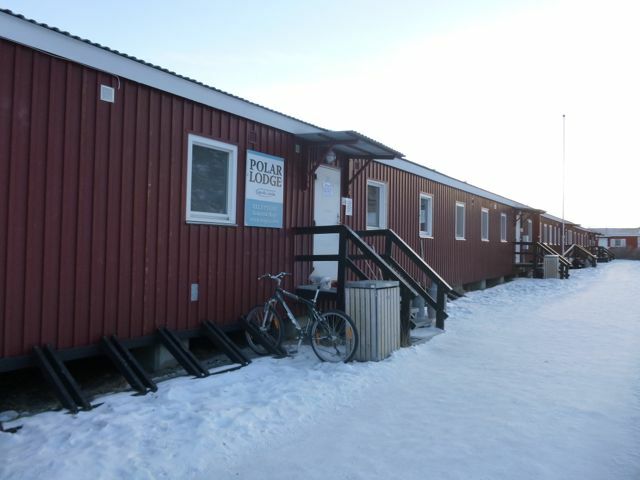 The Polar Lodge is a self-service hostel-style accommodation with 11 locked individual rooms, Wi-Fi for purchase ($8 / 90 kr per hour that can be turned off and on to conserve time), one communal full kitchen, one communal gathering/dining room with a TV, stereo, and desktop computer, and about 5 communal restrooms – some of which are both a WC and a shower room, others of which are either one or the other. It is a totally fine place to stay, but you do need to be self-sufficient. They serve breakfast in the morning, and somebody mans the souvenir shop until the early afternoon, but after around 3:00 PM there are no staff members to be found. Most tourists eat the lunch provided on their day tours (if it is provided), and then go out to eat at the various dining places around town for dinner. So far, I have just bought groceries to keep in the communal fridge to make my own lunches and dinners. Clearly I cannot eat out at restaurants for every meal for almost two months! But on some occasions I do plan to eat at the nice dining room in the airport and also at Roklubben. 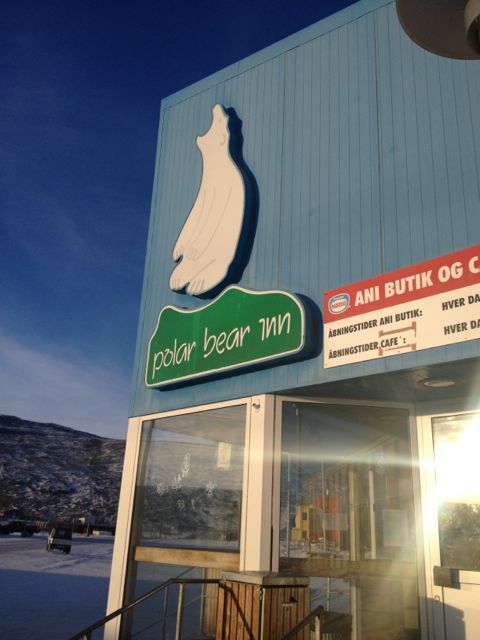 Roklubben is a nice place about 3 miles / 5 km outside of town that serves dinner most nights as well as a special Greenlandic buffet on Sundays that I definitely want to try. Thinking about the meal situation, the format of this trip to Greenland is much, much different than in the summer, and especially here in Kangerlussuaq. In the summer, I was stationed in one place, living a very residential life with a family to come home to every night. But during this trip, I am functioning much more like a tourist because I am staying at hotels most of the time and do not have my own place to “get away”. And while all the other tourists go out for dinner every night since they have such limited time in Greenland, I have to settle in and make Polar Lodge a home for almost three weeks. So in some respects it is a little bit weird to straddle the line between tourist and resident, and some of the tourists do not really get it. 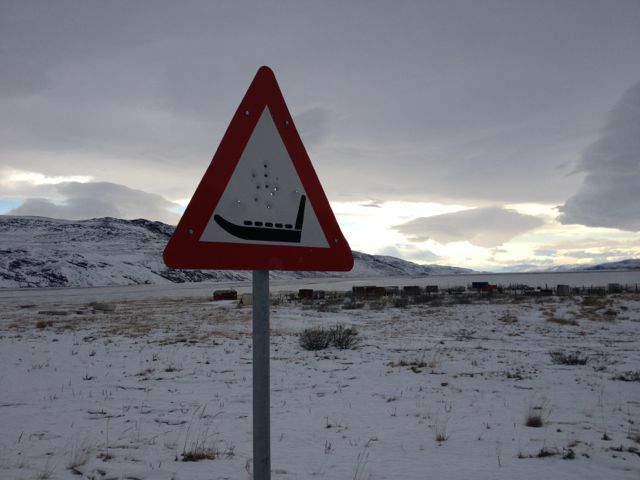 But Kangerlussuaq is the place where this situation will be the most extreme. In Ilulissat I will be staying in a private flat away from the touristy locations, and in Nuuk I will be staying with my family. 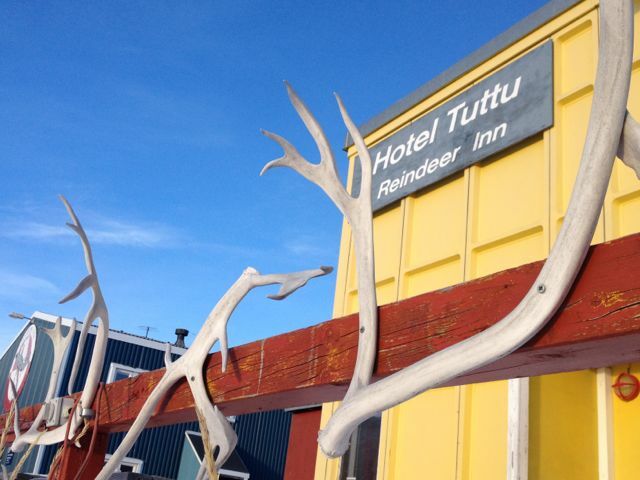 In Kulusuk, I will again be in the hotel with tourists, but only for one week. … and Air Greenland housing as well as private housing. WOGAC’s main location/booking center is located all by itself about 1.4 miles / 2.3 km northwest of the town at Old Camp (another self-service, hostel-style accommodation / souvenir shop that WOGAC owns. It is much larger than Polar Lodge but not as renovated). 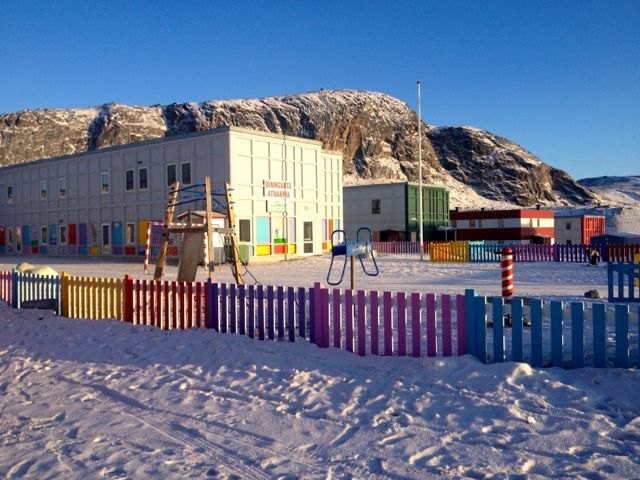 Also on the northwest part of town, about 6.3 miles / 10.1 km from the airport, there is the Kangerlussuaq Harbor where container ships deliver everything to the town and also where cruise ships come in during the summer months. On the northeast part of town is where the roads to the Inland Ice and to Russell Glacier begin. There is also evidently a golf course that way, too! … a museum that is open by request only, a church, a bowling alley, and a sports center with gym equipment and a basketball court. The (frozen) water and a bridge bound the southern part of town…. 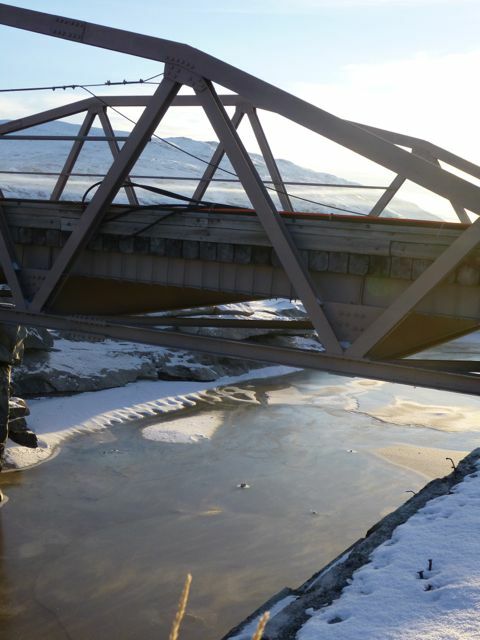 The bridge actually collapsed last summer (because of excessive flowing water from a rapidly melting Inland Ice), and Sharon, the other intern at Visit Greenland with me, was here when it happened and got photos (Photo Credit: Sharon Testor). The only thing south of the bridge for tourists is Roklubben, the restaurant I mentioned earlier that has the nice dinners and Greenlandic buffet. 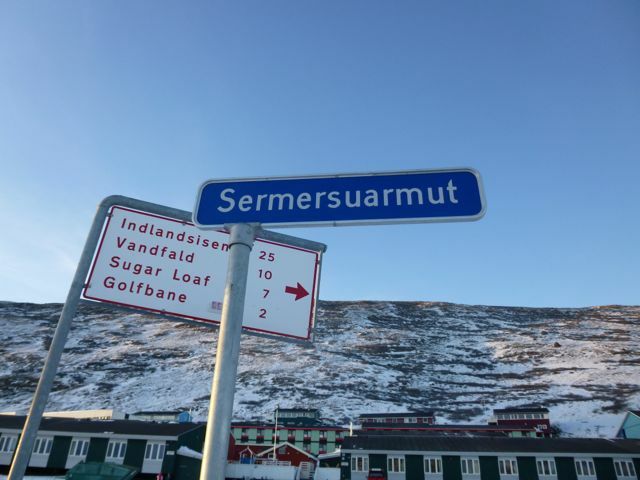 It is about 3 miles / 5 km from town, and essentially, it is the southernmost extent of Kangerlussuaq other than mountains to explore. Finally, the only other real attraction is where the sledge dogs are housed, 2.5 miles / 4 km southwest town. 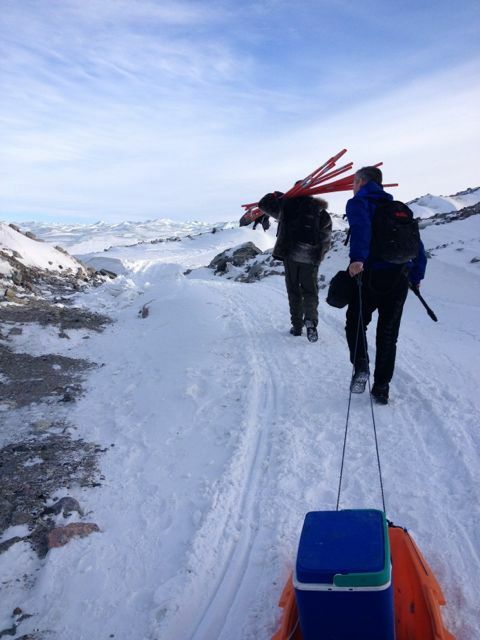 It is accessible by foot via the one main road, but usually when tourists do the dogsledge tours, their tour operator picks them up and drives them to the place. It is quite isolated, but I suppose it is strategically located close to the water so that the dogs can get right out onto the frozen water as quickly as possible! For me, I know what to expect in these Greenlandic towns as far as infrastructure and all, but to a brand new tourist, I could see how they might look around and say, “This is it?” However, tourism activities in this town are heavily focused on being out in the nature – driving to the Inland Ice and glaciers, hiking along the mountains, looking for wildlife, dogsledding, gazing at Northern Lights, and ice-fishing. So for the evenings and nights when tourists are back in the town, there are enough dining places and walking paths to entertain them for the few nights they are here. Despite being such a small place, it does take a bit of planning and flexibility to go where you want because the shops and eateries all have their own hours and it is not a 100% guarantee that they will uphold them. Also, the tour operators’ activities frequently fill up completely, so tourists who come without having booked activities beforehand may not necessarily have the opportunity to do the activities they want to do… or at least not be able to do them when they want to. The town bus (which is essentially a 20-person charter van) is reliable and runs during the daytime, but as with any public transportation, you have to know its schedule and plan accordingly. It costs $1.75 / 10 kr to ride, and a ticket is valid for one hour anywhere in town; you just have to show the driver your ticket stub when you get back on. The bus gets all the way out to Old Camp once an hour, but to most every other place in town twice an hour. It does not go to the far extents of town, like to Roklubben or to the sledge dogs or to the Harbor, so to get to those places, you must either walk from the closest bus stop or take a taxi. 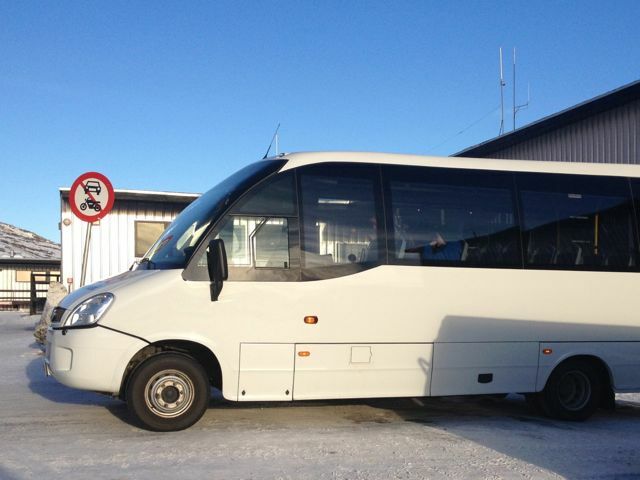 Or, as I mentioned previously, the tour operators typically provide transportation for their customers. 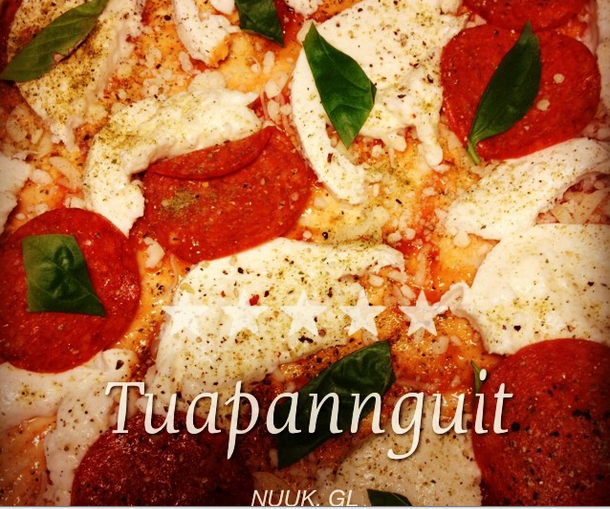 So, that is my “Kangerlussuaq In a Nutshell” tour! Hopefully the interactive map and the descriptions help create a decent picture of where I will be living for these 17 nights before moving on to the next town 🙂 I had intended to upload a number of pictures along with this post (as you can see from my notations), but the internet was running very slowly, and when you pay per time, every minute counts 🙂 I hope to soon edit the post and insert the photos. Hello from Kangerlussuaq, Greenland! I had intended to write on the first night I arrived to describe my first impressions and all. But to my dismay, I had a number of school assignment deadlines to meet over the first few days. Friday was the last day before Spring Break started, so naturally my professors made a concerted effort to keep us fully ‘engaged’ right to the last minute! Well first, the Air Greenland experience from Copenhagen to Kangerlussuaq was just lovely, and I distinctly remember thinking the same thing last summer when I flew from Reykjavik to Nuuk. It is a 4.5-hour flight, but they give so much in-flight service; it is fantastic! I have never experienced anything like it on a domestic American flight, nor on Icelandair. Now, I have never flown first-class or even business class in the States, so perhaps that is why I am missing out, but this is what I imagine it to be like! We got complimentary juice, then a complimentary beverage and hot meal of scrambled eggs, hash brown, bread with butter and jam, and a muffin, then complimentary coffee or tea, then a small Toblerone chocolate, and endless water and tea refills! I made friends with the woman sitting next to me. Somehow between my limited Danish, her limited English, our mutual knowledge of Ilulissat, and much hand gesturing, we were able to keep the conversation going! It was brilliant to fly in over the Ice Sheet / Inland Ice on a fairly clear day! You can see down to the ripples and crevices in the ice and to the mountain peaks, and you can really get a sense of the scale of this island. I have seen this view a few times, but it is never any less spectacular! 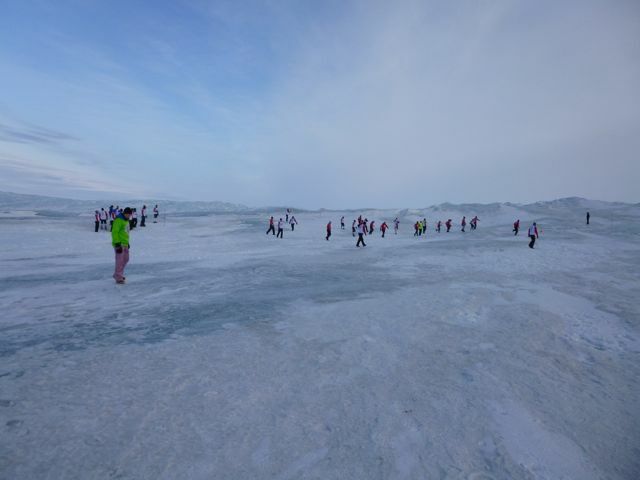 It is fascinating to know that there are people (tourists) that cross the Ice Cap from one coast to the other on foot or with dogsledge! 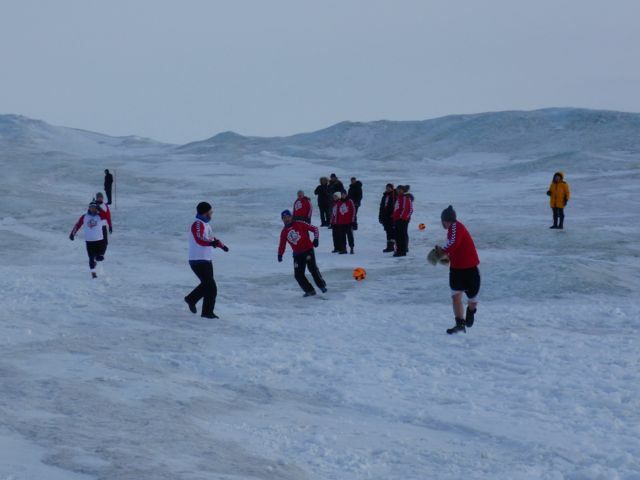 It is just so vast and so bare, with nothing but snow and frozen water to sustain human life. 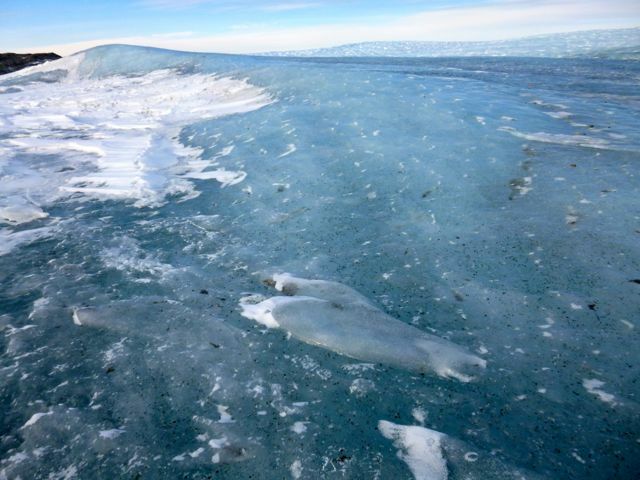 I am sure this sounds so clichéd, and in fact, tourists have said this very thing to me – but when you see the Inland Ice, you get a sense of how tiny one human being is. And when you know that some of that ice has existed for millions of years, you get a sense of how the human life span of 80 years or so is just a millisecond compared to the history of the Earth! Anyhow, when we came through the clouds to land in Kangerlussuaq, there was less snow than I imagined there would be. There is some snow, perhaps 6” or so, but there are a lot of exposed rocks on the mountains. Either way, it still looked quite different from summertime! Once we stopped, everybody started dressing for the cold weather. I have never really experienced temperatures any colder than about -8*C / 18*F, so I really did not know what to expect. The temperature was about -18*C / 0*F when we landed around 10 AM, but it truthfully did not feel cold. I was bracing myself to basically freeze mid-stride, but that was not the case. The only thing that was a new experience was that the moisture in my nose froze instantaneously! Imagine taking a deep breath in through your nose and feeling small ice crystals on your nose hairs! Quite ticklish, really! Having now been here for a few days, I can say that as long as you have the proper clothing, you can stand to be outside for quite an extended period of time. The other day I did a 3-mile / 5-km walk from the airport out to one of the lodgings called Old Camp and back. In total, I was outside for an hour, and everything that was covered was just fine! My cheeks were the only things that were exposed, and they did get quite cold and rosy. In fact, when I got inside to the warmth I had to do a few mouth exercises to get the blood flowing again! I did bring a full-coverage ski mask, and I use that if I plan to be outside for a long time after the sun has gone down – like to watch the Northern Lights. When I go outside, all I wear is: wool hat, gloves with glove liners, two thermal shirts, long underwear/running pants, sweatpants or jeans, windproof pants, puffy down coat, wool socks, and lined winter boots. You know, that’s all J But this week it is supposed to be extremely warm – up to 7*C / 45*F the forecast says! Getting to Greenland for this trip was quite the journey! However, I should give the disclaimer that it was entirely due to my own choosing. Last summer, I traveled to Greenland via the Iceland route, as most Americans would, and spent a few days in Reykjavik before going on to Greenland. This time, I wanted to travel to Greenland via the Copenhagen, Denmark route to see what the Europeans tourists experience. I have never been to Copenhagen, but I heard so much about it in conversation last summer. And Denmark, in general, seems to be an important part of many Greenlanders’ lives because they studied here, or have friends and family here, or moved from here. So I wanted to be able to say that I have experienced some of it, too. As keeping transportation costs low was important for me, I booked a really cheap one-way flight to Copenhagen, but the consolation was that I had to make 2 stops – Washington, D.C. to Boston, Massachusetts… to Reykjavik, Iceland… and finally to Copenhagen. It did add considerably more time to the trip, and perhaps a little bit of concern about making quick transfers and whether my bags would check all the way through, but in retrospect I preferred it. I was quite happy to have the breaks and be able to get up and move around after so much sitting! I arrived to Copenhagen at 1:30 PM yesterday, Wednesday 6 March, after approximately 26 hours of traveling. I was smart and actually forced myself to sleep on the flights even though it was like going to sleep at 5 in the afternoon for me! Last year when I took the red-eye from the US to Iceland, I did not sleep a wink and consequently got quite sick from sleep deprivation. I am staying in a really nice little boutique hotel – Bertrams Hotel Guldsmeden in Vesterbro. It is such a lovely place with great service, free Wi-Fi, and a delicious breakfast… and the canopy bed is like heaven! Not to mention, it is perfect walking distance to everywhere I need to go. It is just fantastic – like staying in somebody’s home, really! I should mention that in addition to having never been to Copenhagen before, I have also never been to Europe before! So this was a first for me in many ways! I suppose many people wonder why on earth I would want to travel alone to a new country – a new continent even – all by myself. But really, since I grew accustomed to the Danish language and culture while in Greenland, when I arrived in Copenhagen I felt very comfortable. I think it would be a much different experience if I knew nothing about the place. For holiday, I would, of course, prefer to travel in company with others, but when it is ultimately a business trip, you can always use that as the “cover” for why you are all alone in a foreign country. Yesterday, I went to Nørreport and the student metropolis area to visit with the Ace & Ace Productions crew who film the Taste of Greenland series for Visit Greenland. They gave me the grand tour of the office, and we also went for coffee and a bite to eat. It was nice to see them in their ‘natural habitat’. Now I really feel like I have a full understanding of the Taste of Greenland series from witnessing the raw filming on location, to seeing their home base in Copenhagen, to seeing the final product on TV and DVD. It really is quite special for me to have been able to foster a relationship with the crew because it is their filming and handiwork that virtually single-handedly sold me on Greenland! A tourist said to me a few days ago, ‘When you see Greenland, you either love it or you hate it,” and Ace & Ace’s cinematography definitely made me love it! For dinner I went to a restaurant called Falernum on recommendation of the hotel front desk. It is a cozy little wine bar with Italian-inspired food, and just around the corner from the hotel. I was surprised to find the place fully packed on a Wednesday night, but I think that must be the European lifestyle. They are not so squeamish as Americans (or Washingtonians) are to go out on weeknights for fear of having to wake up extra early to sit in a few hours of traffic! 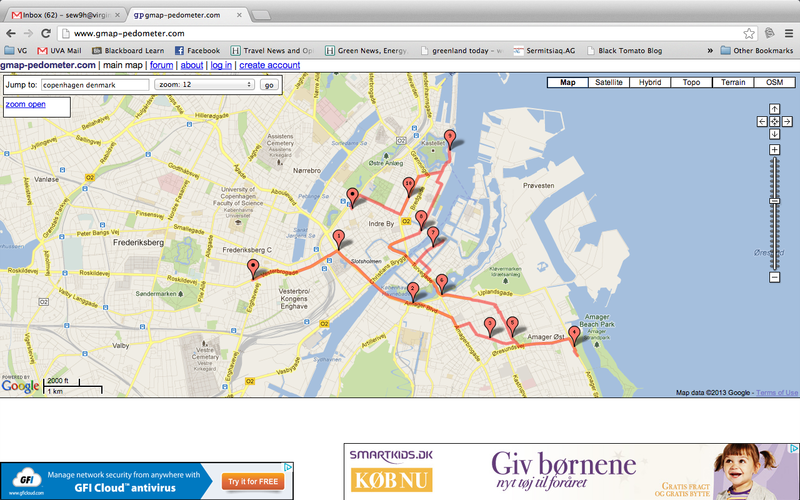 Today, Thursday 7 March, I did a grand citywide walking tour – over 10 miles / 16 km in total! 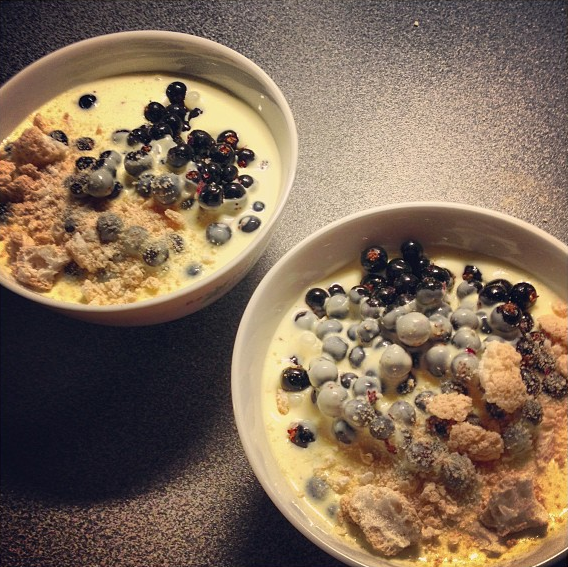 For dinner, I went to my friend Maia’s house in Nørrebro. Maia and I were both interns at Visit Greenland in Summer 2012, and while we only knew each other for about one month’s time, we had stayed in touch through Facebook. She is a fantastic vegetarian cook, and she served a spicy vegetable salsa appetizer, pasta with almonds, garlic, truffle, and cheese for a main course, and homemade licorice ice cream for dessert! She and her friends often do small “supper club” dinners where they cook delicious new food for each other, so it was really special be a part of it! I generally find Danes to be extremely welcoming and open, and it was so nice to go to a foreign country where I have never been before and feel welcome! It was a fantastic evening of seven girls sitting around a table eating good food and drinking wine and laughing! Finally, I am back to the hotel to pack my bags and get ready to head to Greenland! Of course I am not able to sleep a wink! It is quite an odd feeling to lie here feeling like there is something else I should be doing, but in actuality, everything is done – everything is set in place for me to take this trip that the only thing left to do is get on that plane tomorrow morning! I have been thinking about this second trip to Greenland since before I even left the first time, and after so many months of thinking about it and telling people about it, it actually became a rehearsed thing I said more than something I really reflected on. Also, the last couple weeks have been so extremely stressful between school and work that I hardly had time to think or do anything for myself. So despite lying here in Copenhagen, I still have not even stopped to realize that the tomorrow I will be back in Greenland after five months of dreaming about it!